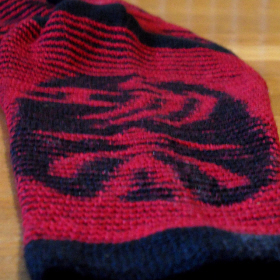 During a holiday in China I bought some lovely red yarn in a shop not far from the Forbidden City in Bejing. 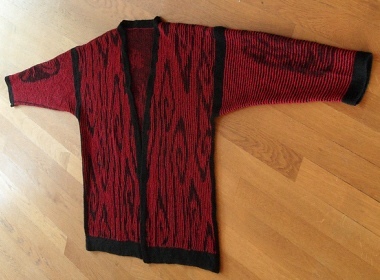 This seemed perfect for a Chinese styled illusion jacket, combined with matching black yarn. A Chinese style jacket needs simple kimono lines. Free kimono patterns are abundant on the internet, so some of these patterns and a swatch gave me the amount of stitches and ridges I would need for my jacket. 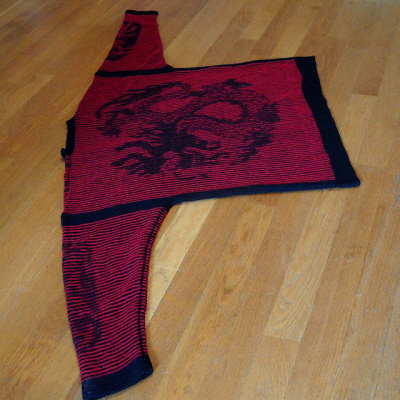 A Chinese style jacket in illusion knitting, using the yarn I bought in Beijing and a lovely black cashmere. Since both yarns are laceweight, everything is knitted with two strands of yarn. The back of the jacket has the dragon, the fronts will be in an abstract cloud pattern and on the sleeves I’ll place Chinese seals with the characters for ‘skill’ and ‘practice’. July 19: decided on measurements and started drawing the dragon. August 28: about halfway done with the knitting. The illusions are drawn, except for the ‘practice’ seal. September 2: back, fronts and one sleeve knitted, all patterns ready. 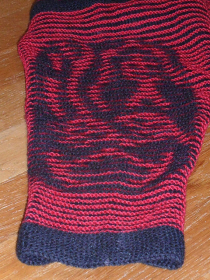 September 7: finished knitting, halfway through the irritating part of sewing/knitting the pieces together. For the striped parts I picked up stitches along the borders of the pieces, then used a three needle bind off to put them together, which gave me a nice and regular finish.